Okay, so once again I will tell you guys that my heart melts with barest thoughts of Greek mythologies. There's just something about it that pulls me in with so much force and you won't see me for days. And with Carter's works, The Goddess Test and Goddess Interrupted, I'm falling deeper in love with the mythology. Instead of portraying Hades as a really bad dude, he's actually pretty decent, and I like this new twist on it. And he's desperate for companionship, which he finds in Kate, and more. I don't believe you have to read this one to read the last installment to the series, but I'd recommend it. It was wonderfully spun tales for each of the characters, even if it didn't end all heart-melty gushy. Because it was a retelling of Greek gods, I almost immediately loved it. Almost. 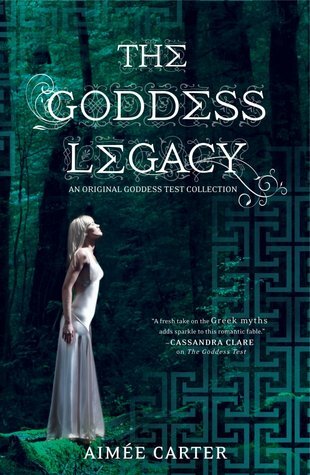 So, if you love Greek mythology as much as I do, or even if you're on the fence, pick this one up! I hope you all enjoy this one as much as I did.